Like all surfaces, masonry can benefit aesthetically from a coat of fresh paint from time to time. On exteriors, where weather is a concern, masonry paint provides protection against damage caused by the elements. Stucco, brick, rock, and rock veneer can all benefit from some type of masonry paint or coating. There are three main types available, depending on your specific needs. In many cases, this is the best choice for outdoor applications. Cracked masonry can allow wind-driven rain and snow into the structure, causing damage. It is water, freezing and expanding, that causes and deepens cracks in masonry surfaces. In many areas, rapid cycles of freezing and thawing are common during the winter. A hairline crack can quickly expand to many times its original size. Elastomeric coatings prevent this in a couple of ways. On new masonry, they provide a seal that prevents water from penetrating the surface. On damaged surfaces, elastomeric paints bridge the gaps, effectively holding together cracked areas and preventing them from expanding further. 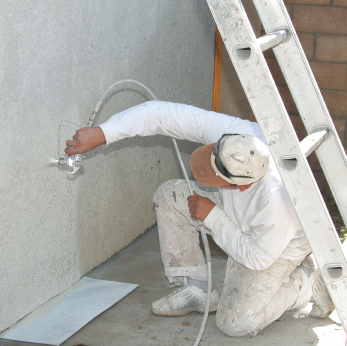 Elastomeric paints, also known as elastomeric wall coatings, or EWCs, are very thick coatings. When dry, they are typically 12-15 mil thick- about four to five times as thick as a typical latex paint. They contain flexible acrylic binders, which allows the coating to expand and contract with the wall as the temperature changes. Like all good brick and stucco paints, elastomeric coatings combine a seal that prevents water from entering a structure with breathability that allows moisture inside to escape. Priming is usually not necessary with elastomeric paints; however, you should seal the surface if it is less than 30 days old, or if chalking, efflorescence, or extreme porosity is a problem. When shopping for an elastomeric product, read the label carefully. The best performance will come from one that contains 100% acrylic binders. Both smooth and textured versions are available. Apply the coating as directed. In most cases, the instructions will call for two very thick coats for maximum performance. Do not skip the second coat or apply it in thinner layers than recommended. Elastomeric paints can be painted over with latex (never oil-based!) paint; however, it’s important to wait at least one year after applying the elastomeric finish before doing so. Exterior Insulation and Finish Systems, commonly referred to as EIFS, are a type of wall coating that mimic stucco. Essentially, these systems consist of three layers: a foam insulation board that’s installed directly over the exterior wall; a water-resistant, mesh-reinforced middle layer of cement and polymers; and a textured acrylic finish coat. These types of systems, first used in the 1970s to replace traditional stucco, have a few major advantages. They provide a layer of exterior insulation not available with other finishes, offer flexible design choices, and help make homes more airtight. Unfortunately, EIFS systems also have some major disadvantages. In very wet areas and climates with dramatic temperature swings, moisture can penetrate the surface, causing cracks and damage to underlying surfaces. Newer systems include drain systems and moisture barriers (installed under the insulating layer) that minimize these problems. Still, in some parts of the country, using these types of finishes on wood-frame buildings is not allowed due to the potential for water damage. EIFS installation is not really a project for DIYers. Poor choices in materials, or incorrect installation procedures can result in severe structural damage to your home. Finding an experienced contractor is the best option if you prefer this type of finish. Acrylic cement paints work much the same way other acrylics do. They’re water-based and easy to clean up. Formulated specifically for use on masonry, they often contain anti-bacterial and anti-fungal additives. In addition, they are more flexible than regular interior and exterior paints, allowing for some expansion. Priming the masonry surface is usually optional with this type of paint, although several good acrylic primers are available. If the surface has existing damage or chalking, priming may be a good idea. Although less resistant to moisture, standard interior and exterior acrylic paints can be successfully used on masonry in many cases. Applying acrylics directly to the surface works if the masonry is new or undamaged. First, clean and seal the surface with a good masonry primer. Once it dries, apply two coats of latex paint. Rock, stucco, and brick painted with standard acrylics need to be repainted more frequently than similar surfaces treated with an elastomeric coating or special cement acrylic. They are also more susceptible to moisture penetration and related problems. DO take the time to properly prepare the masonry surface before painting. This includes repairing damaged areas, treating underlying moisture problems (like leaky roofs and poorly drained basements), and cleaning off any dirt, oil, or efflorescence. DO seal cracks with acrylic or urethane caulk. DO seal and prime new, porous, or very chalky surfaces. DON’T used alkyd (oil-based) topcoats over existing masonry paint. DON’T buy the cheapest product you can find.